Congratulations to Dr. Sara Andrabi for receiving the 2017 EMRA Fellow of the Year Award! This award is given to a fellow member of EMRA that has a record of creativity, enthusiasm, and accomplishment in addressing issues pertaining to emergency medicine a the local, state, and national level. Dr. Andrabi was born in Rawalpindi, Pakistan and raised in Houston, TX. 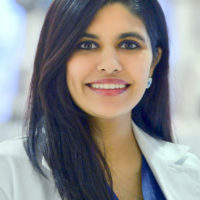 Her interested in medicine was peaked when she attended DeBakey High School for Health Professions, after which she completed undergrad from the University of Houston. She completed medical school and EM residency at Baylor College of Medicine. Dr. Andrabi has been involved in organized medicine since she was a medical student and work with TCEP, EMRA and ACEP through various avenues. After finishing her chief year, she started an administration fellowship at Ben Taub General Hospital. During her fellowship, Dr. Andrabi developed an interest in blending the education and administration worlds. Her interests include curriculum development and education in patient safety and quality improvement. Most recently, she has been working on initiatives focused on the ACGME Clinical Learning Environment Pathways to excellence. In her free time, she is usually trying to keep up with her two toddlers (both residency babies)!